Map of the "Ord" Township 27 Totten & Crossfield's Purchase Essex County, N.Y.
Map of resident lots and Zack Lake Tract from surveys by Hon. Wesley Barnes for the Forest Park & Land Company, of which William West Durant was president. 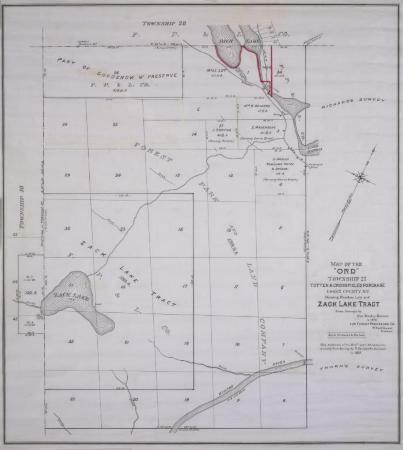 Map includes Zack Lake and parts of Rich Lake and Lake Harris in Township 27 or the Ord Patent. Scale of ten chains to one inch. Source: Adirondack Museum Library, MacIntyre Iron Works records, MS 65-27, box 3, no. 177.